Remember that luscious yarn I mentioned last week? I bought this yarn after Adria requested a hat to match a scarf she ordered from Organic Lifestyle. 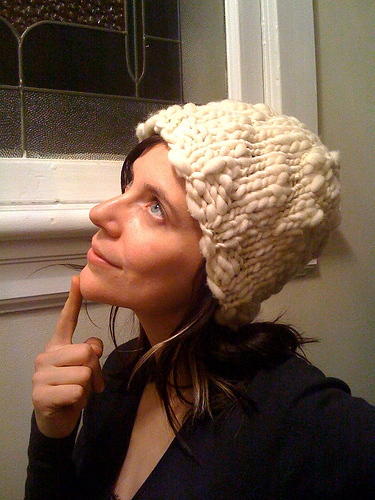 Even though Adria’s birthday isn’t until Valentine’s Day, I finished the hat on Monday night, so I took it over with me to her house on Tuesday since we were hooking up for dinner and I was sure the hat was going to be way too big, so I wanted her to try it on before I wove in the ends. It turned out to be perfect just the way it was. Voila! Early b-day gift. This yarn varies between roving-like, serious thickness to very tightly wound thinness, which makes for a beautifully varied texture.I originally planned to make this hat with cables but once I got going I could see it would be beautiful as just plain old stockinette stitch. It was a super quick knit. I think I had it finished in about 45 minutes to an hour. I cast on 40 stitches with 10mm circulars, and worked K2 P2 ribbing for a few rounds, maybe 4 or 5 (I forget because I was just doing everything by eye). It probably would look just as nice as K1 P1 ribbing. The body of the hat is worked until its about 6 inches from the beginning, and then I began decreasing by K2tog every 6 stitches; knitting a round; then decreasing every 5 stitches and so on. By the round in which I was decreasing every 4 or 3 stitches (forget which one) I started decreasing every round until I had I think 5 stitches left. At that point I just pulled the yarn through those stitches and cinched it up tight, weaving in the ends. Adria is totally thrilled. She calls it her oatmeal hat.